Shereen is hosting 'Sew Crafty Fridays'. So, if you are sewing, quilting, scrapbooking, knitting, or crochetting, stop by her blog and add crafty post to the Mr.Linky she has posted on her blog. Posted by Lisa at 1:33 p.m.
Lisa, what a great idea. Mona, from Keeper of the Home was actually on the phone with me when I read your post, we both thought that was such a neat idea. It's almost like factory style, which I'm sure makes it easier to get in a good flow of making the same cards. That's also a great gift idea. Way to go!! Thanks for sharing with us. March 9, 2007 at 2:20 p.m. Yes, lol :o) She told me what your idea was and I think it is just LOVELY! How neat! Thank you for sharing the lovely idea! Your cards look wonderful! 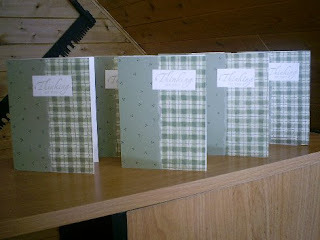 I picked up card making a couple years ago from a Stampin Up! rep, it was neat to see all the great things you can do with it! You did a great job! March 9, 2007 at 3:05 p.m. Thank you both for stopping by. :o) Yes it easier to make 6 or so at a time, since I have everything out to use. 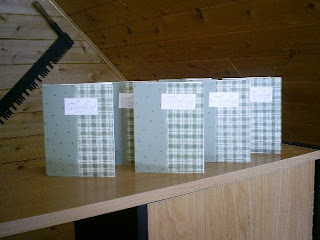 :o) My friend sells Stampin'Up, so I have bought sooooo much stuff......too much I think. ;o) But I really do like their products. March 9, 2007 at 4:51 p.m.